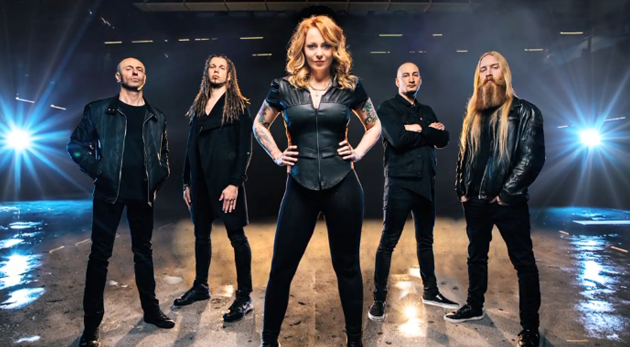 Dutch metal singer Anneke van Giersbergen has been undoubtedly a reference as one of the most talented female metal voices for more than two decades, since her early beginnings with the band The Gathering. Having a special relation with Helsinki where she visits and performs often, and with a wide list of collaborations with amazing bands and projects such as Moonspell, Within Temptation, Anathema, Devin Townsend Project or Ayreon, Anneke loves Tuska festival in Helsinki, and Tuska festival loves her back. Anneke was the queen of the opening Friday day at Tuska performing live 3 times during a busy evening, with her new band Vuur, in a short acoustic solo for some lucky winners of a competition and closing the night as special guest together with Devin Townsend Project. An excellent opportunity for the Finnish fans to enjoy once more her amazing vocal skills, special energy on stage and perennial charming smile. Thanks for your time Anneke! You come to Helsinki quite often, and this time is with your new band Vuur. Can you tell us a bit more what the fans here in Finland can expect from the incoming gig? Thanks to you too! Yeah, it has been a long time since I made a true metal album, cause I have been all over the place and I love all kind of different styles of music, I just love singing. But I felt when we were working on The Gentle Storm like I wanted to continue making a solo album with these same guys, the live band of The Gentle Storm, cause they are so good! I was very inspired by them, so I thought that if I wanted to make a metal album on my own, I had to do it now and with these guys, so I did! And it turned out even better than I expected, there is a good vibe around it and people are excited anticipating it!. If I am not mistaken there is already released the first official track. How are the plans for the release of the album? We are doing one or two more tracks before the album gets released in October and we will do some summer festivals anyway where we play new songs, so there will be new songs online, in Youtube etc. Do you feel easier now with the new technologies and social media to reach your audience? Yeah, I think is great to have Youtube, Spotify and the whole thing. It is easier to get our music out and to get people to the shows. Of course maybe you sell a bit less Cds than 20 years ago but it does not matter, we need to be creative! You are going to have a busy day today right? After Vuur concert you will make a small solo acoustic show and Devin Townsend is playing later, are you gonna join them? Yes, I am going to join them. 3 shows today, but I am looking forward to all 3! I remember that you were here in Tuska last time 2 years ago when you came with The Sirens, I saw that show. What memories do you have? I just love Tuska festival, it is a fantastic festival and I love it every time since I came here. I wanted to come back with Vuur very much and I was on the trousers of Jouni (Jouni Markkanen, Tuska Festival promoter) to bring us here. He booked us even without listening to the album! So he believes in me and in the band and that is so cool! It is great to have a few festivals before the release of the album. Yeah, that’s the thing about the Finnish, like you said, they are collected and quiet but there is so much fire and passion, and you can see it, you know. But when the song finishes, they are loud. It is a crazy thing about Finland. I remember in 2010 for example when you came with Anathema, not sure if you have memories of that day, but the people were really crazy at Tavastia Club! I also wanted to ask you about the special concert you gave 3 years ago for the 25th Anniversary of The Gathering with all the previous artists. How did it feel? It was great, it was very peculiar cause when we talked about it, and with some people I have not seen them for 8 years, and then we talked about the reunion and then we started rehearsing and it felt like yesterday that we played these songs together, it is crazy, and it was 8 or 9 years ago when we did, but it felt like at home. I was at The Gathering for most of my young adult life and the influence that you get at this age period is very big. Yeah, of course promoter said “you could go on tour” and I am sure we could have made a lot of money, etc but we said “let’s keep it special”. We never say never for a next time, but you have to keep it exclusive and is more special that way. Plus I am busy with everything else I do. After such a fruitful career in music and having participated in so many nice collaborations with talented artists and bands, do you feel lucky to have made good friends in the music industry? Yeah, totally! The only friends I have!! Hehehe, no more social life, most of my real friends are in music and then apart I have one or two girl friends that I know from the time before music, but at that period I was just 14! So my life and my family and everything, all has to do with music. But musicians in general they get each other, they understand the lifestyle, the weird hours, the passion, the way you are always busy with music and with creating something. You seem to have a busy rest of the year 2017, touring with Vuur, doing some more solo acoustic concerts, sharing tour with Epica, the new album getting released. How do you face the incoming busy months? I like busy, the album is done and is almost on the shelf waiting for release, we are doing the promotion for the album with festivals and gigs, and in October we are going on tour. We have some really nice things coming up. I like it as I have not played so much for a long time since we were at the studio and I wanted not to do 10 projects at the same time, I was really focusing but that means that you are not playing a lot and I start to miss it. I love being at home and doing laundry, etc it gives me peace, but when I am not playing I get restless. I kind of need it, but is a good balance on and off. I know a lot of people who tour all year around every year and they get a little bit off balance. And after that, do you have plans in the longer run for the incoming 2018 or so far just focused on 2017? Well, I think for the moment playing with Vuur and at some point writing for an incoming new album. I will do also some solo stuff next months in Holland, theater shows and a classical show with orchestra. And I like that, active but not too much, like before with The Sirens and a new album incoming and you know… usually 5 projects at once and that is insane, so I try solo, acoustic and Vuur as my focus now. As the time for your show with Vuur is coming close, I do not want to take more of your time so you can prepare. Anything else you want to add for the readers and the Finnish (and foreign) audience here? Well, I am here in Finland around two times per year, they invite me so many times that I feel a bit like being my home away from home, I have great friends here and I love this festival. I am looking forward to playing here again!